Creative clusters may be primarily about groups of businesses working in close proximity, but they are often also social spaces where people meet and generate their own ‘creative energy’ as this story of one cluster demonstrates. The GoDown Arts Centre is one of several nodes (gathering and connecting points) that have emerged in Nairobi’s cultural landscape over the past decade. The GoDown cluster comprises, at any one time, about a dozen creative outfits who conduct their business out of a commonly shared, acre and a half-sized compound. Lean-to structures (used formerly as sheds for motor vehicle repairs) now converted into roughly equally sized modules provide simple spaces for creative work. Located in the very middle of the lot is a warehouse that still retains its characteristic pitched gable roof but has become the primary multifunctional presentation space of the GoDown. On a typical day at the GoDown, young web designers-in-training from Nairobits may be seen mingling with contemporary dancers on a break from their rehearsals. Buni TV producers, ordinarily occupied behind the closed doors of their filming studio at the bottom of the property, may be found negotiating with Ketebul Music a deal to hire the music studios for voiceover recording. A member of the GoDown programmes team, meanwhile, will have slipped ‘next door’ to Matisho a small design business, to commission the delivery of five thousand branded t-shirts for the GoDown’s annual Nai Ni Who citywide festival. Busy to meet an exhibition deadline, a group of visual artists have left their individual studios along the south wall of the compound to assist a colleague hang up his paintings in the GoDown Gallery (situated in the central warehouse) - an affordable photographer friend is at hand to take pictures. Outside, in the open courtyard a pair of hip-hop musicians prepares to shoot a scene for a music video, against one of the GoDown’s many graffiti covered walls, as a businessman from the adjacent block, who has dropped in at the GoDown eatery for a lunch of fried fish and sukumi wiki (kale) surveys the goings-on with keen interest. The aggregation of creative energies makes for a charged atmosphere full of possibilities, promoting exchange, collaboration and business. This is the experience of the hundreds of artists and creatives who arrive at the GoDown daily to connect and to create. The cluster is home and business rolled into one. It is a claim to an address, a validation, sign of a growing creative economy. 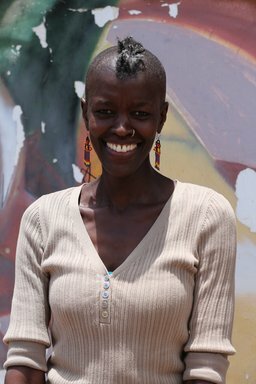 Joy Mboya is the Founder and Director of the GoDown Arts Centre in Nairobi, Kenya.